Archbishop Gregory is an extraordinary archbishop. He was the guest of honor at this year's Bishop James Augustine Healy Award Dinner, hosted by our Office of Black Catholic Ministries, and I have had the pleasure of being at his Eucharistic Congress in Atlanta twice. 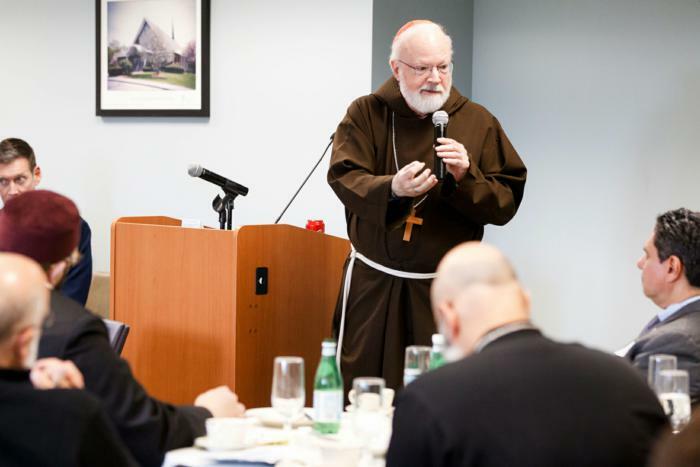 Of course, during his time as the president of the U.S. Conference of Catholic Bishops, he led us through the meetings that led to the passing of the Dallas Charter and then did an extraordinary job responding to the sexual abuse crisis. Having him in Washington -- where he will be the archbishop of one of the largest black Catholic communities in the United States -- is also a great blessing and I am sure it will be a great source of pride for the people of Washington. We wish him well, though we know it will be hard for him to leave Atlanta after so many years of successful ministry there, but we know that the Archdiocese of Washington needs him. We accompany him with our prayers and best wishes as he responds to this latest call of the Church to serve as a shepherd. On Monday, we hosted a gathering of Boston-area faith leaders at the Pastoral Center to discuss the ramifications of legislation being considered on Beacon Hill known as the Act to Remove Obstacles and Expand Abortion Access, or ROE Act. I addressed the meeting and we also heard from George Cronin, Father Bryan Hehir, Fran Hogan, and Marianne Luthin. This legislation is being touted as a means of preserving present abortion access at the state level, but it really goes far beyond that. It would do away with the requirement that a minor receive parental or judicial consent for an abortion, open the way for full access to late-term abortions and does not demand that a child who is born alive as a result of failed abortion be cared for. It would also allow funds in a program intended to reduce infant mortality to be used to help pay for abortions. So, we were anxious to bring together the leaders of various faith communities to discuss this issue. I was gratified by the quick response of the interfaith and ecumenical community. Joining us were leaders of Protestant, Jewish, Muslim, and Mormon communities, who came together to discuss how we can let our people know about this legislation. Our fear is that people will not know this is even being considered until it is too late. Polls indicate this is not what the vast majority of Americans want. I think we need to remind legislators that, while many Americans are in favor of legal abortion, this does not translate to the kinds of radical and extreme provisions that are included in this proposed legislation. We are grateful to Vito Nicastro and Father David Michael of our Office of Ecumenical and Interreligious Affairs for their work in helping to organize this event, which came together on such short notice. Bishop Paolo Martinelli, OFM Cap., an auxiliary bishop of Milan, gave one of the addresses.